The Bryant and May series has been going since 2004, with Full Dark House, and this is the ninth book. The tenth is already published (The Invisible Code) and the eleventh is imminent. For me, each one of the books has been a terrific read, but sometimes the mystery element is a little variable. Here, Christopher Fowler presents us with a classic whodunnit – but it’s so much more than that. One of the real triumphs of Fowler’s writing is that he makes Arthur Bryant, a detective who looks for solutions in the most unlikely places – a waxwork museum, for example – into a thoroughly believable character. Somehow this most unlikely of characters feels like a real person, and he’s a constant joy to read about. And when he realises that he may be responsible for… something… well, my heart went out to him. In fact, all of the main characters get some development here – the relationships between two pairs of characters get some focus and move in one direction or another. A new plot strand that I presume will run into the next book is introduced, although not as overt a thread as the Mr Fox story that linked the last two books – this one should be able to support whatever plot the author wants to introduce. The other thing… normally, I tend to tune out when there are discussions of the psychology of the murderer. Not here – these elements, where the team, and Bryant in particular, try to work out what the killer is playing at, are utterly riveting. Add in the historical elements , from Punch and Judy to the London theatre and this is a stunningly rich book. One thing – the visual clue that finally gives the killer away really doesn’t translate into the written word. However, the killer is guessable at least – I spotted them, although partly because there’s an echo of a trick from an Agatha Christie book that made me look at them a bit too closely. That sort of thing happens when you read a lot of crime fiction, I’m afraid. It’s probably more of a one-theory-fits-all-the-facts solution than a what-does-this-clue-mean solution, which includes the locked room part. But regardless, this is a fantastic read – totally engrossing, entertaining and Highly Recommended. I must admit I’m very keen to read this given all the praise it’s received, but I’ve only read the first three Bryant and May books and I found those a bit over-stretched and under-clued. If I skipped ahead to this one would it a) make any sense and b) ruin the intervening books if I decided to go back to them? Oh! Maybe I’ll read Ten Second Staircase next. I like the sound of that one too. Ten Second Staircase was my first Fowler so I have fond memories of it. These sorts of reviews always remind me I need to get caught up on Fowler’s fiction. Same story here. I used to love the PCU books (and Bryant! ), but never picked this one up when it came out. I’ll have to remedy that. However, I have to add that I thought the first four or so books, up to White Corridor, were superior to the ones up to Off the Rails. It felt like these wildly imaginative, neo-Victorian mysteries had morphed into standard police procedurals with weird elements, but the last few ones seem to be return to earlier ones. I am one-third through the book and really enjoying it. Not only suspenseful but also very humorous.The writing style is impressive. I shall comment further after finishing the book. I have finished reading the book and am totally disappointed with the ending and the solution. The final clue relating to the method of SPOILER is simply rubbish. A common method of SPOILER cannot be applied to all SPOILER——–there will certainly be exceptions. Most of the other clues are also unsatisfactory. Many interesting aspects of the case turn out to be complete blinds. There is an irrelevant strand (involving another murder) which is totally unnecessary and simply adds to the number of pages. The motive for the bizarre crimes is far-fetched. Even after the solution is revealed, the bizarre actions of the murderer seem incomprehensible, not making any sense. I think that the clue you mention is perfectly reasonable but I’m not going into why without spoiling it – I’ve edited your comment to make it more obscure for people who haven’t read it. And the various strands are to support the imagery of the Grand Guignol, which pervades the entire book, including the murders and the motivation, giving a cohesive feel to the whole thing. Sorry that this wasn’t for you, but I have to disagree with your comments here. Yes, it’s no Agatha Christie-esque whodunnit, but it’s not trying to be. It’s a mystery novel for the 21st century that draws upon the rich past of Punch and Judy (and many other things) and a cracking read. 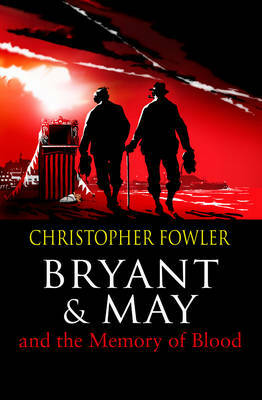 May I just add that I love the Bryant and May series – not all of them work at a variety of levels, but the writing is rich with fascinating detail, the settings are vividly drawn, and the whole read is very satisfying. One more thing, the audio versions are superb! The reader, Tim Goodman, gives a terrific performance and I have now listened to a couple of them twice. Highly recommended. I’m actually a little surprised that it hasn’t made the leap onto television with such rich characters – although could anyone really do Arthur justice? I admit to having cast Peter O’Toole as Bryant but haven’t come up with a good May. Since this is totally for my own entertainment I don’t mind casting from among the dearly departed, or completely against the authors descriptions! Possibly too young, but maybe Bill Nighy as Bryant?